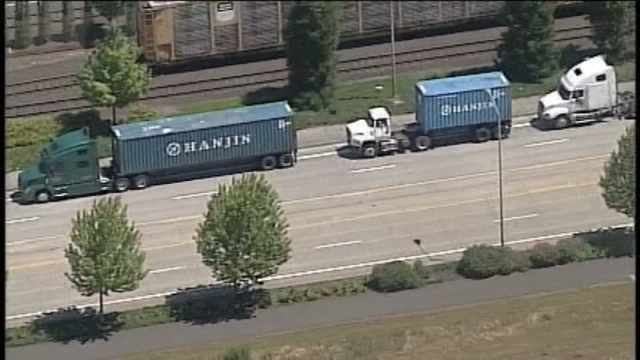 When two major container shipping companies withdrew operations at the Port of Portland earlier this year, many wondered how the change would impact the region's freeways. Goods that once moved by marine vessel instead started moving by truck to other ports. Regular commuters who make the trip from Clark County to Portland say congestion is noticeably worse this year. But harrowing tales of gridlock don't necessarily prove cause and effect. There is at least some evidence to suggest the shake-up at the Port of Portland has further strained the region's highway system -- including in Vancouver. The port estimates that an additional 1,700 trucks are now on the area's freeways each week. In Vancouver, the Washington State Department of Transportation has observed a 9 percent increase this year in the average daily truck volume on Interstate 5, said spokesman Bart Treece. In other words, your suspicions are correct. Your bad commute just got worse. "We're going to see longer commute times," said Don Hamilton, an Oregon Department of Transportation spokesman. "We're going to see more midday congestion and weekend congestion." In Oregon, total vehicle miles traveled -- a broad measure of all traffic volume in the state -- is up by 6.4 percent so far this year, Hamilton said. An uptick in the number of trucks is likely not a significant contributor to that, he said, but it is one of many factors that affect traffic conditions around Portland. For an interconnected transportation system already at capacity in places, it doesn't take much to throw things into a state of chaos. "Any small problem on the roads ... is going to cause delays," Hamilton said. "There is a level of frustration that people are having out there, and it's understandable." The withdrawal of container carriers Hanjin and Hapag-Lloyd from the Port of Portland's Terminal 6 facility put an undeniable dent in the port's operations. In Hanjin's case, it may take "several years" to recruit a replacement carrier of that size, port spokesman Kenny Macdonald said in an email. It's difficult to quantify the exact impact of that change on the region's freeways. Officials don't have definitive data to point to, even if they have plenty of horror stories. But it's not a stretch to draw a connection between the carriers' withdrawal and recent traffic woes, according to ICTSI Oregon, which operates the container facility at Terminal 6. "ICTSI Oregon would not be at all surprised that the lack of activity at Terminal 6 and the resulting diversion of cargo to other ports is causing additional congestion on local highways and roads," the organization said in a statement to The Columbian. "However, we have not studied the issue in detail and therefore have no information as to the magnitude of the traffic congestion problem that has developed." Transportation officials in both states have taken steps to alleviate congestion where they can without big-ticket construction projects. Advisory speed signs, travel-time estimates and other tools can help the system operate more efficiently, Hamilton said. Washington has used small fixes such as lane reconfigurations to improve traffic flows and reduce congestion. One of the worst trouble spots in the region continues to be northbound Interstate 5 approaching the I-5 Bridge into Vancouver, Hamilton said. "That's no secret to people who drive that every day," he said.